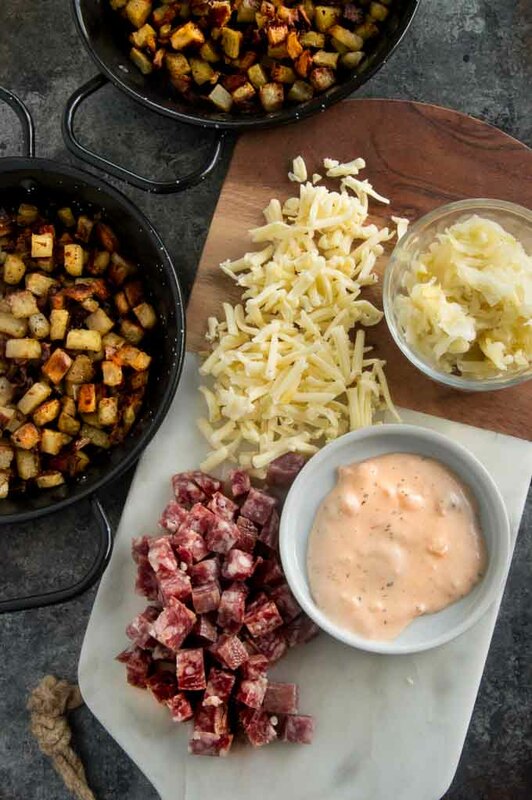 This Reuben Tatchos recipe is an easy one pan hearty appetizer with crispy potatoes smothered with all the fixings for Reubens, cheese, corned beef and kraut perfect for springtime entertaining or any game time viewing! Springtime means warmer days and cooler evenings and in our house that means we have company over on Friday and Saturday nights outside. 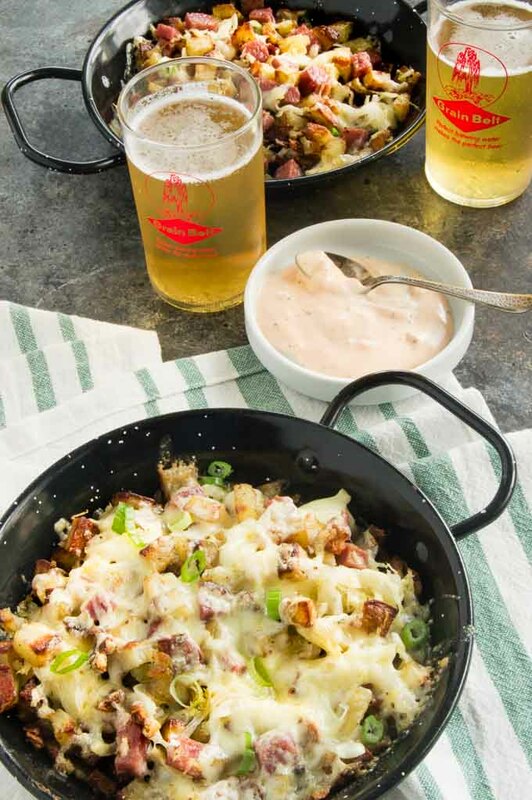 Todays recipe for Reuben Totchos fits perfectly for a hearty appetizer offering for a casual get together after a long week! 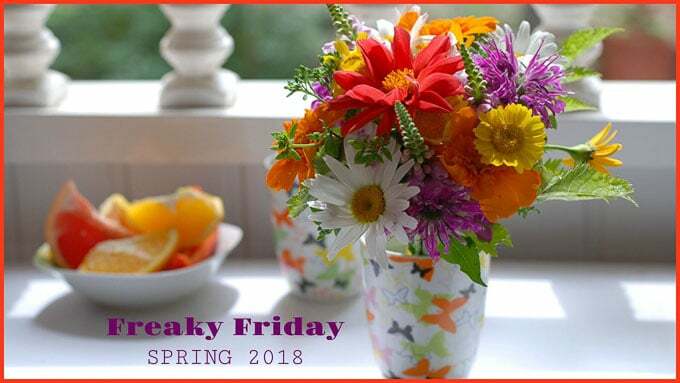 I’m super exited to be participating in Freaky Friday Springtime Edition today. Several of my food writer friends get together and exchange websites to make a recipe from another writer and share it with our readers. I think its a win-win as I get to make a friends recipe to enjoy and then I get to share with my readers another site another site you might not have been familiar with to find delicious recipes from. Her site is all about entertaining! She was encouraged by her friends and family to share her photos from her parties on a blog. You know from following me that I believe good food is an event that needs to be shared and Michaela also believes that entertaining for friends and family is a great way to share good times and create lasting memories! I’ll be honest, I’m a recent convert to sauerkraut. My husband on the other hand would eat it morning noon and night. I tried her Reuben Casserole and I couldn’t believe how much I liked it. It added just the right tang and texture and suddenly I wondered what I had been missing out on. 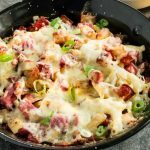 Then I realized that was probably more of a fall or winter dish so I switched to her Reuben Totchos recipe to share with you today! What is in Reuben Totchos? Michaela makes them with store bought tater tots. I was going to do that, but somehow got home without the bag in my cart?? Then I was going to make my homemade Bacon tot’s recipe to use in them, but then I decided that I really wanted to follow Michaelas example of making totchos the easy way! Since I didnt want to go to the store and I did have potatoes I simply cut up the potatoes into small cubes and roasted them on the pan. Once the potatoes were roasted its simply as easy as preparing the potato nachos! Generously topping the crispy potatoes with the corned beef, kraut, and cheese. Bake them in the oven until the corned beef release some of their juices and the cheese is nice and melty! Sprinkle the top with the green onions and serve with a thousand island dressing for people to drizzle over the top! Trust me your company will devour every bite! 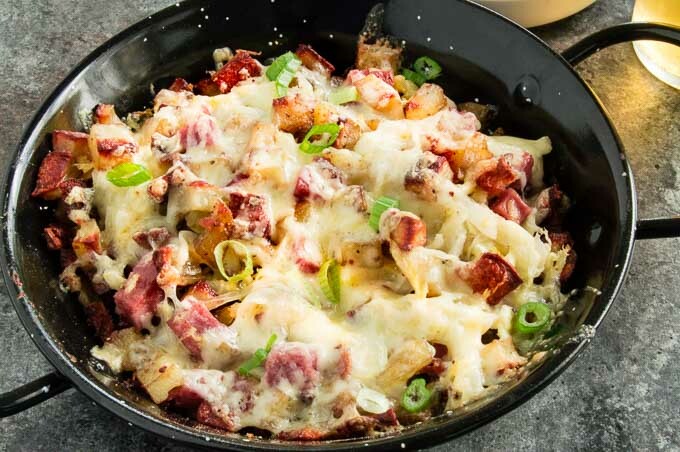 These Reuben Totchos are hearty enough you only need to make the one appetizer because its filling enough you feel like you’re having a full meal! Serve them with a good German lager or your favorite beer! 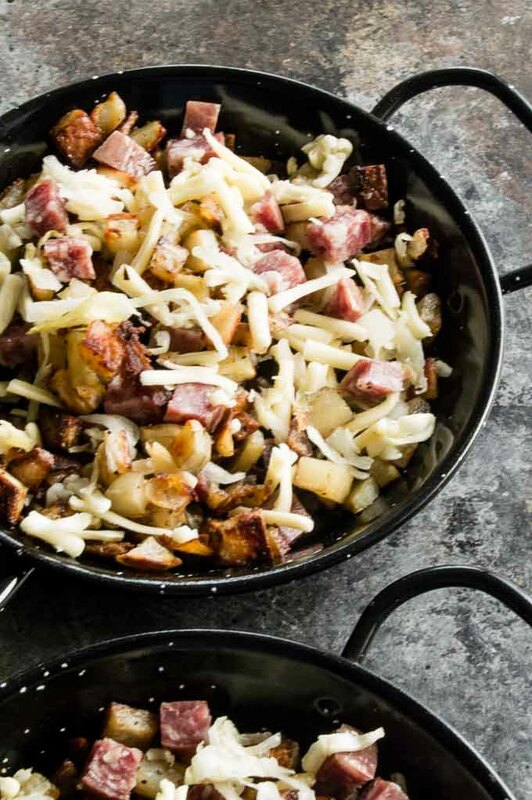 This Reuben Tatchos recipe is an easy one pan hearty appetizer with crispy potatoes smothered with all the fixings for Reubens, cheese, corned beef and kraut perfect for springtime entertaining! 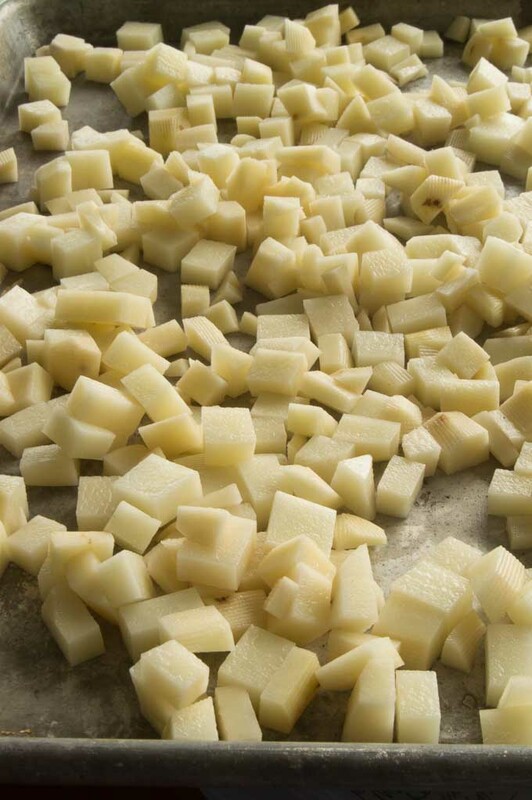 Peel russet potatoes and cut into 1/2" diced cubes. Place on sheet pan and toss with olive oil. Roast for 40-45 minutes until golden brown. Remove when potatoes/tots are baked and crispy. Toss both kinds of cheese together and sprinkle over the top of the potatoes/tots. Turn oven to High Broil. Place sheet pan back in the oven, and watch closely, removing them as soon as the cheese melts. about 10 minutes. What a great dish! Love the change-up from tots! LOVE Reubens…this is so tasty!!! Michaela is the queen of all things Reuben and these totchos are no exception!! Two delicious worlds have collided here, cannot wait to make these! Oh heavens that melty pan of deliciousness looks amazing. I’d love to dig in and might not even wait for a fork! I love kraut and the creative way that Michaela has used it. Um, can I just sit here and drool over this REUBEN TOTCHOS??? They look so good! Oh my gosh these look delicious! I love how simple they are but dang, all that flavor! I could make a meal outa these, YUM! I’m recently a sauerkraut convert too, so I’m 100% on board with these totchos! They looks so cheesy and delicious and I’m sure the sauerkraut gives it all just the right amount of tang! These look like so much fun. I love the idea of making tater tots with some fun nacho toppings. This is a fabulous recipe! I have to make this soon, I love reubens and tater tots! The combination of flavors just sounds so perfect! Anything with corned beef is a win in my book. Especially one that has potatoes in it, too! This is one perfect mash up!! I think this will make for a winning party snack at our next friends happy hour! So many great flavors! First off — DROOL!! I love that you used the fried potatoes, totally trying that next time! I am quite proud that you have become a sauerkraut fan after cooking from my blog. (takes a bow) Thank you for the kind words. I am so happy you found lots of things to try and enjoy! !